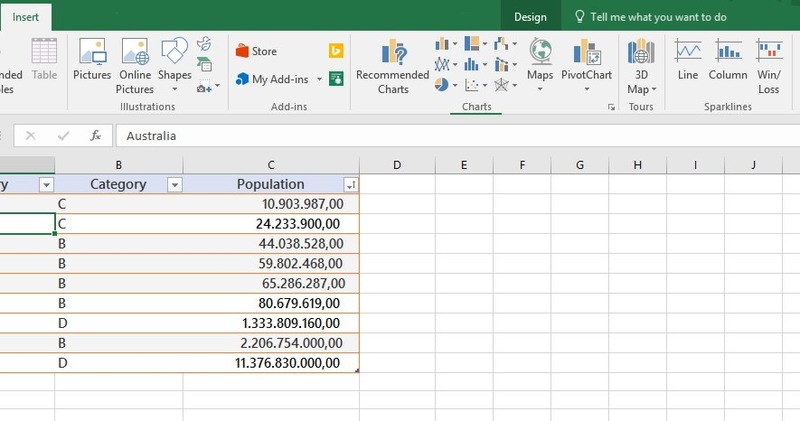 As we can see in the image below, in the Spreadsheet I have inserted data that contains Countries and the Population of each country. *Note that the inserted data has been formatted as a table. Once we have the necessary data inserted in our Spreadsheet, we select the Insert tab and then we locate the area of the ribbon named Charts as shown below. 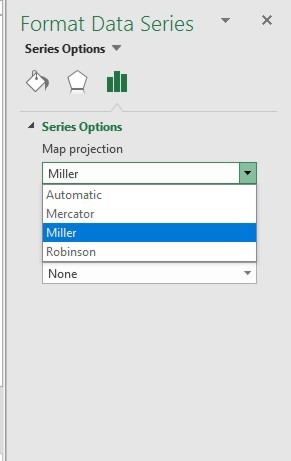 Then all we have to do is to select the Maps command from the area of the ribbon named Charts, and from the drop down menu that appears we select the command Filled Map. 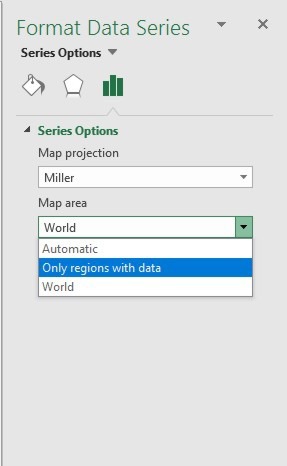 In the image below, the Filled Map command is selected from the Maps drop down menu, and straight away a Map has been inserted in our Spreadsheet per the Data that we had inserted. In the next image, I have moved the Map Chart to a Worksheet on its own, in order to view all the details. The Design and Format tab have been activated on the ribbon, where we can use the available commands in order to change elements on our Map Chart. Add Chart Element: We can add a Chart Title, Data Labels or a Legend. Quick Layout: We can quickly change the overall Layout of the Chart. Change Colors: We can customize the Color and Style of the Chart. Chart Styles: We can change the Style of the Chart with one of the available ones. Switch Rows/Columns: This command is not available in Map Charts. Select Data: We can change the Data Range used in the Chart. Change Chart Type: We can change to a different Type of Chart. Move Chart: We can move the Chart to another Sheet or Tab in our Workbook. Sort: This command is not available in Map Charts. In the image below, we also notice the Format Task Pane appears at right of the window. 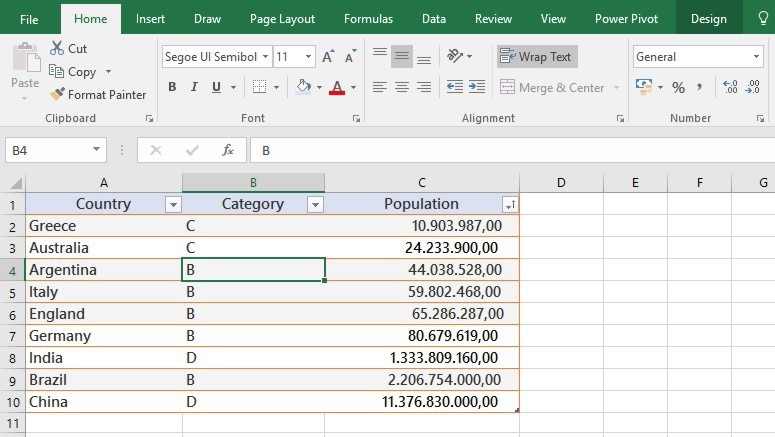 We can use this Task Pane in order to modify and format our Map Chart in many more ways. Mercator: The Mercator projection is a cylindrical map projection presented by the Flemish geographer and cartographer Gerardus Mercator in 1569. It became the standard map projection for nautical purposes because of its ability to represent lines of constant course, known as rhumb lines or loxodromes, as straight segments that conserve the angles with the meridians. 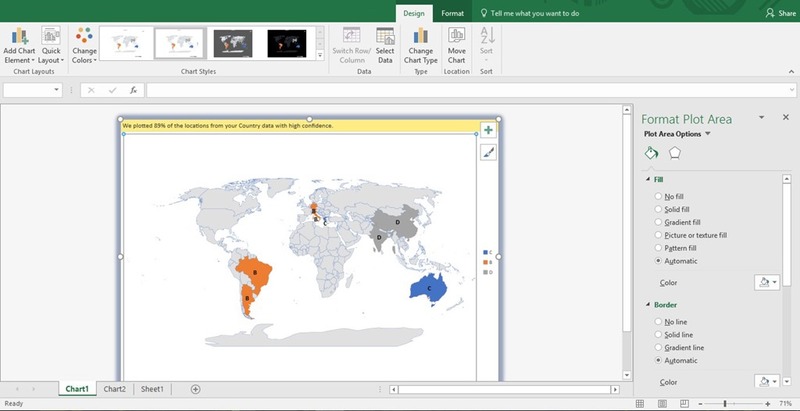 Below you can check out the video describing How To Create A Map in Microsoft Excel 365. 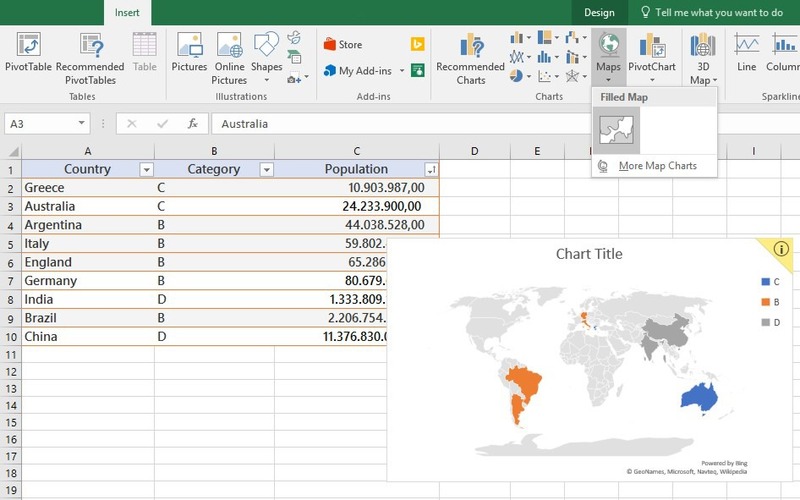 Posted on January 11, 2017, in Excel 365 English, Microsoft Office 365 ProPlus English and tagged Add Chart Element, Automatic, Change Chart Type, Chart Styles, Charts, Countries, Filled Map, Format Task Pane, Geographical Regions, How To Create A Map in Microsoft Excel 365, Insert, Map Chart, Microsoft Excel 365, Miller, Move Chart, Office Smart, Office System, Only Region With Data, Postal Codes, Quick Layout, Robinson, Select Data, Smart Office, Spreadsheet, States, Switch Rows/Columns, World. Bookmark the permalink. 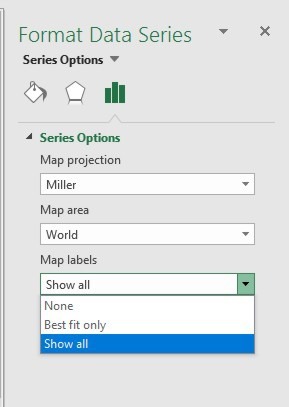 Comments Off on Create A Map Chart In Excel 365.